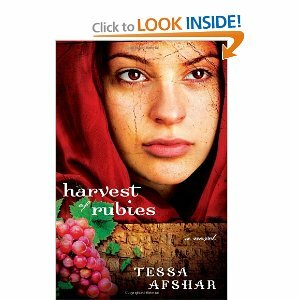 This is a wonderful story set in ancient Persia during the time of King Artaxerxes and after Queen Esther’s time. This is my first novel by this author and it won’t be the last! Another novel, Harvest of Gold, continues the story begun in this novel and will be reviewed here soon. Sarah is a young woman who can do something most other women of her time can’t…read and write. She began teaching herself Persian at the age of 9 to earn her father’s love and attention as he is a scribe in the royal palace. Sarah makes this her goal in life too. She achieves her goal, but isn’t fond of the politics that go on in the palace. She solves a mystery for the queen and as a reward gets a husband. At the age of 23, Sarah is doing what she wants in life and doesn’t want a husband, aristocrat or not. Once married, she will have to give up her dream. She tries everything to get out of the marriage, but to no avail. She knows she will be miserable in this marriage as she doesn’t know how to cook, take care of a household and she certainly isn’t pretty. What is she going to do with her time now? Darius has been forced to marry a commoner and isn’t happy about it. He promised his Jewish mother that he would marry a Jewish woman and he has kept that promise, but he isn’t giving his new wife any benefit of the doubt after the stunt she pulled at their wedding ceremony. He catches glimpses of her true character, but he is reluctant to trust her. What is she up to? Can Darius learn to fully trust his wife? He finally returns home to a mess, but solves it with Sarah’s help. He slowly begins to spend more time with her and learns more about her. She seems trustworthy, funny, loyal and spirited. Is this just an act? Readers see Sarah’s insecurities and her efforts to banish those insecurities through finding her worth in what she does and what people think of her. I can certainly identify with that. Can you? The wonderful wise gardener, Bardia, whom Sarah comes to love like a father tells her that pruning the vine is for its’ own good and done to enrich its’ yield. Sarah suddenly sees the parallel of the vine with her own life. It is at this point that she begins to see how God is using the difficulties in her life not to punish her, but to make her life better. She learns to pray to Him regularly and often and be content in her circumstance. I just loved Sarah, her witty sarcasm and the snappy dialogue between characters. Sarah’s growth in faith is inspiring and at the same time challenging. I can definitely recommend this book without reservation. It is entertaining from beginning to end. Readers won’t be disappointed.